SHOCKING news emerged this morning as it was revealed Jeremy Corbyn laid a wreath for diabolical Decepticon leader Megatron at the scene of his demise, Autobot City. The EVIL Megatron was fatally wounded in a battle with the noble and heroic Optimus Prime, before being carried away by his terrorist army and never seen again. Decepticon sympathiser, Jeremy Corbyn, was pictured laying a wreath in honour of Megatron at the scene of the battle by reporters for the Chester Bugle. It was disgusting. He skipped along carrying his wreath and laid it down where that monster was defeated. So many brave heroes died that day, and he honours the Decepticon who orchestrated all that destruction. The heroes who died that day included Autobots Ironhide, Ratchet, Gears and Prowl, as well as many others. They all died after the evil Megatron launched a surprise attack on Autobot City, killing countless Autobots. 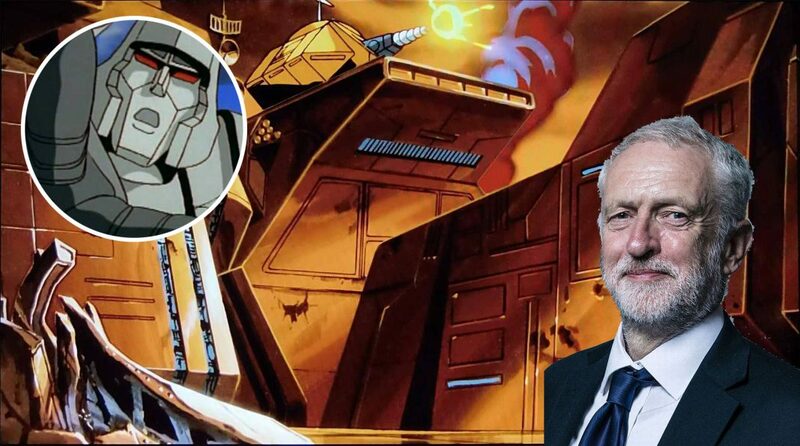 Corbyn has shamed their memory by choosing to honour Megatron, and has shown where his true allegiances lie. Megatron was remade by Unicron into Galvatron. Yes, but Galvatron was a different character with a distinct personality. As a result, Megatron effectively ‘died’ as a result of his attack on Autobot city.